One of the many questions customers wonder before hiring any sort of service is how much money they will spend, especially when it comes to insulating their home. Spray foam Insulation Pricing is usually calculated by the volume of a board foot in many areas (1 board foot = 12” x 12” x 1” thick). It is important to know that pricing can vary widely from state to state. the interior or exterior parts of a home or building. For example closed cell spray foam can be used in areas where contact with water is likely to occur. Open cell spray foam can be used in areas that have little exposed to moisture. Open cell foam insulation is cheaper whereas Closed cell is a little more pricey. The price difference is due to a few different factors, mostly the difficulty of installation and the amount of base product each different product uses. What area do you live in? This will also be an important factor as to how much you will need to pay. Prices vary from place to place. 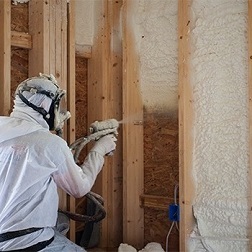 Most of these variations in spray foam insulation cost are due to the cost of labor in your area and the price the base material pricing and of course the amount of local demand has an impact as well. As you can see, there is not a specific set price for spray foam insulation, pricing varies due to various factors. What is true though, is that despite what you may spend, it will be worth your every penny.